Today Bandai Tamashii Nations revealed their pickup items due for release in April 2019, and among them is a highly awaited figure for Ultraman fans – S.H. 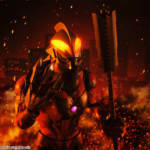 Figuarts Ultraman Belial! Previously revealed via magazine scans and later unveiled at the Tamashii Nations 2018 event, this figure is based on the dark Ultra warrior’s standard Reionics form which he took after merging with Alien Rayblood. S.H. Figuarts Ultraman Belial will be a general retail release in April 2019, with the price and full accessory count yet to be confirmed. What we do know however is that he will be packaged with his signature Giga Battle Nizer weapon. We’ll bring you more information on this figure as it comes, but in the meantime check out the full selection of images after the jump! Tamashii Nations’ steady stream of Ultraman S.H. Figuarts releases continues on into 2019 with the announcement of S.H. Figuarts Ultraman Zero! Not to be confused with the S.H. 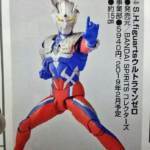 Figuarts Ultraman Zero Beyond figure due out in November, this standard version of the dimension-hopping son of Ultraseven is due out in February 2019 with a price tag of 5940 yen. It also looks as though the figure will be a standard retail release, though this is yet to be confirmed. The magazine scans also reveal that the figure will include his Zero Sluggers (which can fit both on his head and chest to replicate his “Zero Twin Shoot” attack) and Zero Twin Sword weapon. Will you be adding S.H. Figuarts Ultraman Zero to your collection? Check out the full selection of images and sound off after the jump!